After Apple Company expanded its streaming subscription service of Apple Music, users are lucky to enjoy thousands of music videos. 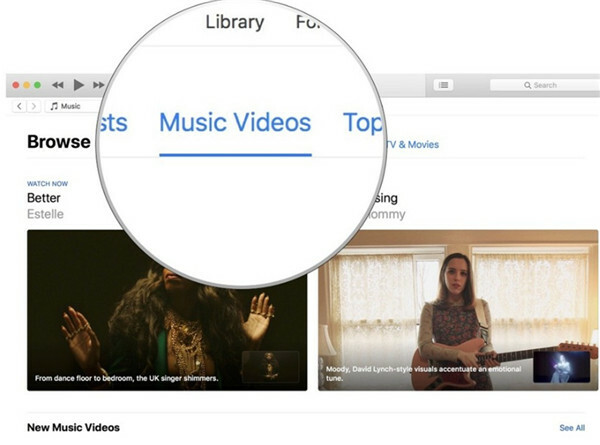 Apple Music now had become a new home for music videos, such as the ones of Taylor Swift, Beck and etc. However, the case is that not everyone knows how to watch music videos on Apple Music iPhone and Mac. In order to allow more Apple users to get to know the method to make the most of this service, this guidance is released for them to refer to. Apple music is an app and a streaming service with revolution nature. You can browse the whole music catalog of Apple Music in your favorite device easily. No matter where your music comes from, maybe from iTunes Store or the ripped CDs, they have now been stored in the catalog of Apple Music in which the songs have already been over 50 million. You can download your favorite songs from it for offline listening on your all devices. 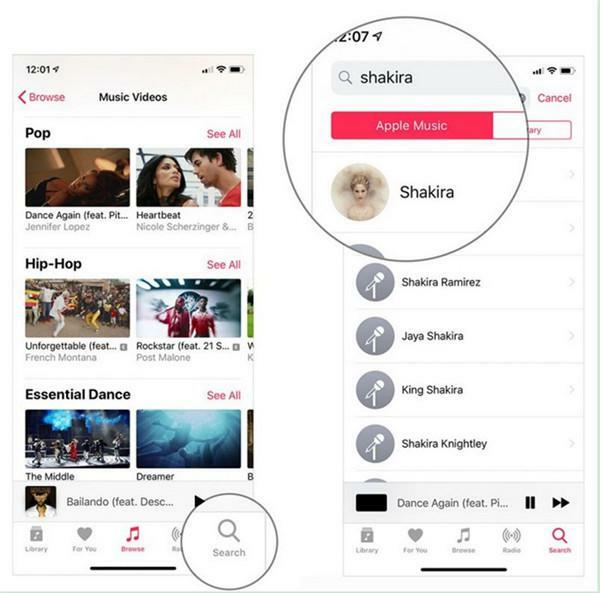 Any song, album or playlist can be chosen as per your preference, Apple Music will offer the best service to you. Curation is regarded as the soul for each playlist in Apple Music. 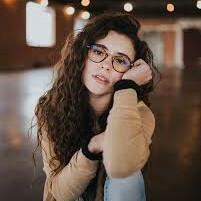 The high- intelligent music experts from different area in the world devote themselves to make a perfect playlist to attract the listeners. The new combination of album, new release and the playlist are provided by the section “For you” in Apple Music, they are all customized designed for you. Apart from human curation, with the help of Siri, you can enjoy the fun and great music from Apple Music. To watch music videos on Apple Music has become a wonderful choice to kill time. With numerous hot and popular music videos on offer, Apple users can get something really amazing to catch up with. As for how to make use of this service to enjoy Taylor Swift Apple Music video or music videos of other stars, the following illustrations will be useful for you. You can master the way to watch Apple Music streaming video on iPhone via reading through this part. 1. On iPhone, run Apple Music app and then hit “Browse” button. 2. Tap on the option of “Music Videos” that is underneath the tab of “Playlists” in the menu. 3. You can click on the one that you desire to watch and then enter into the interface of its detailed info to pay for it to watch. You can also make use of the “Search” bar to find your favorite music video to pay and enjoy watching. If you want to watch Apple Music videos on Mac, the steps shown above can assist you to make it. 1. Open iTunes of the latest version on Mac computer and then hit “Music Videos” option, which is next to “Playlists” at the top of the screen. Log into iTunes with your password to prepare for the payment. 2. You can click on the one you are fond of watching and then navigate to the detailed information interface to pay for it. The “Search” bar can also be taken advantage of to find your desired music video. You can have the permission to watch the target music video on Mac. The steps shown above are primary. 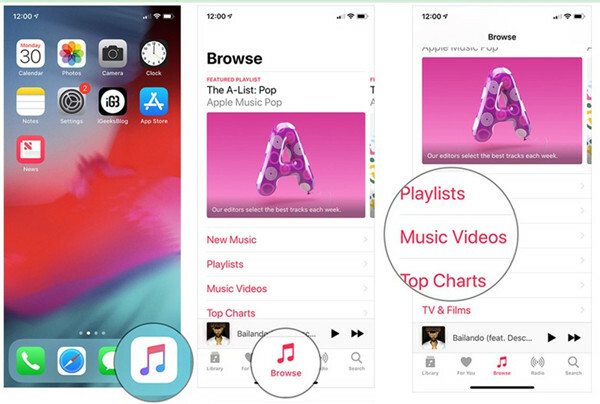 As a matter of fact, you can also try to add music videos to your iTunes Library, download them to iPhone, create an Apple Music video playlist or share a video with your friends. As for the tutorials of these further operations, you can search them online if you are interested in them. Here I just would like to direct you to know the basic steps to watch music videos on Apple Music. You have the authorization to add music videos to your Library in Apple Music when you have subscribed to it. Run iCloud Music Library on your device before you begin to add content to it. You can use the same Apple ID to log in Apple Music in different devices or on Mac or computer. You can follow the instructions as below to add music videos. 1. Launch Music app on your iOS or Android device. 2. Tap on the plus sign to add one single song. If you want to add the entire video content of album or playlists, tap on the sign “+ADD” to complete this step. You can find the video content in the library after the music videos contents have been added. 1. Run iTunes on Mac or computer and find the video content you would like to import to your library. 2. The second step is the same as adding music videos to device in the above mentioned. Through Apple device or Mac, share extensions can be done on different places such as Facebook, Twitter or Messages. Likewise, music video can be shared to various kinds of platforms. You can follow the steps as below to share a video in Apple Music. 1. Put the music video that you want to share to a playlist. 2. Long press to video on Apple device or right click on video on Mac. 4. Select what place the music video you want to share to. The link of video can be shared or copied to Twitter or Facebook directly on your Mac. While, on Apple device, it can be shared to more kinds of service like Facebook, twitter, Pinterest or other chat apps and more. The music videos can be downloaded to your iPhone for offline watching, no matter it is found in the Library or in Apple Music. Your playlist can be built for watching music video anytime and anywhere. The following instructions will guide you how to download the music video to your iPhone in Apple Music. 1. Choose the music video you would like to download to your iPhone. 2. Tap on the plug sign button on your iPhone which stands beside the video. 3. Choose the button “Download”, the icon of a cloud with a downward arrow is the sign of downloading. Before you decide to download the music video to your iPhone, remember to check the storage capacity on your device to prevent the failure in downloading. Music videos always needs at least 50 to 100 MB for storage. 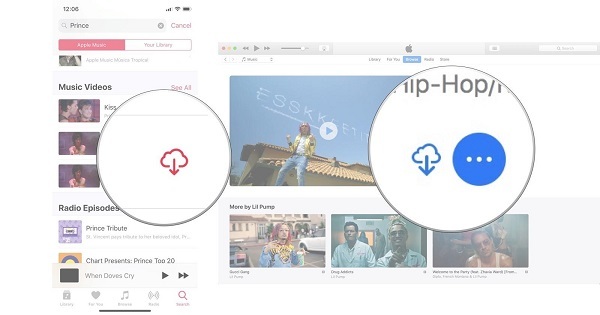 If you have downloaded some of your favorite music videos from Apple Music via the cloud icon, you can further transfer them to Mac for better viewing. It will be more wonderful to enjoy the music video on a larger screen, which can also save your iPhone storage space at the same time. 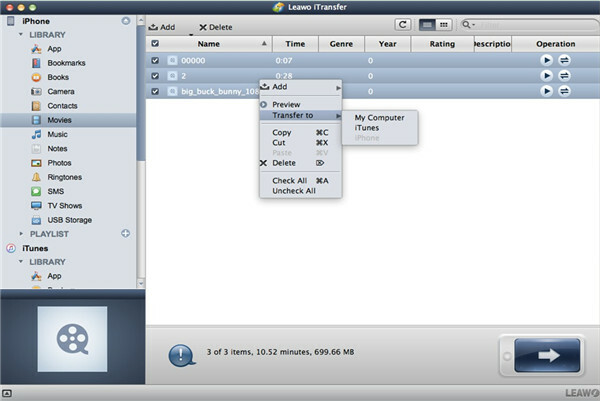 If you are in need of this function, Leawo iTransfer for Mac can take this responsibility perfectly. It can finish various kinds of transfer tasks excellently. Its superior features have won a good reputation in the software market. Computers and iDevices are supported by it, and it can even perform effectively for iTunes. This program may be just the right one you should choose to help you. Now you can concentrate on reading how to transfer downloaded music video from iPhone to Mac with several clicks via this tool. Run the software on Mac and then you need to use one USB cable to connect iPhone to Mac. This will activate iTransfer for Mac to detect your iPhone device automatically. Click on iPhone icon and then hit “Movies” tab under the menu of “LIBRARY”. You can see the music video name list in the right part of the window. Click to check the ones you want to transfer to Mac and then hit “Transfer to> My Computer” after you tap on transfer button at the bottom right of the screen. In the dialog that shows up, you need to check “Save to Folder” and click “Change” button to browse Mac to prepare a target folder for the exported music videos. After that, you can hit “Transfer Now” to activate the transfer process from iPhone to Mac. This process can save you much time, which only takes you several seconds to make it. 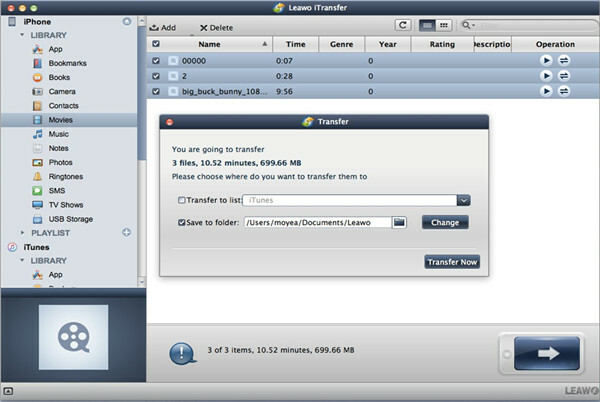 You will become keen on this tool once you download and install it on Mac to accomplish various transfer tasks.